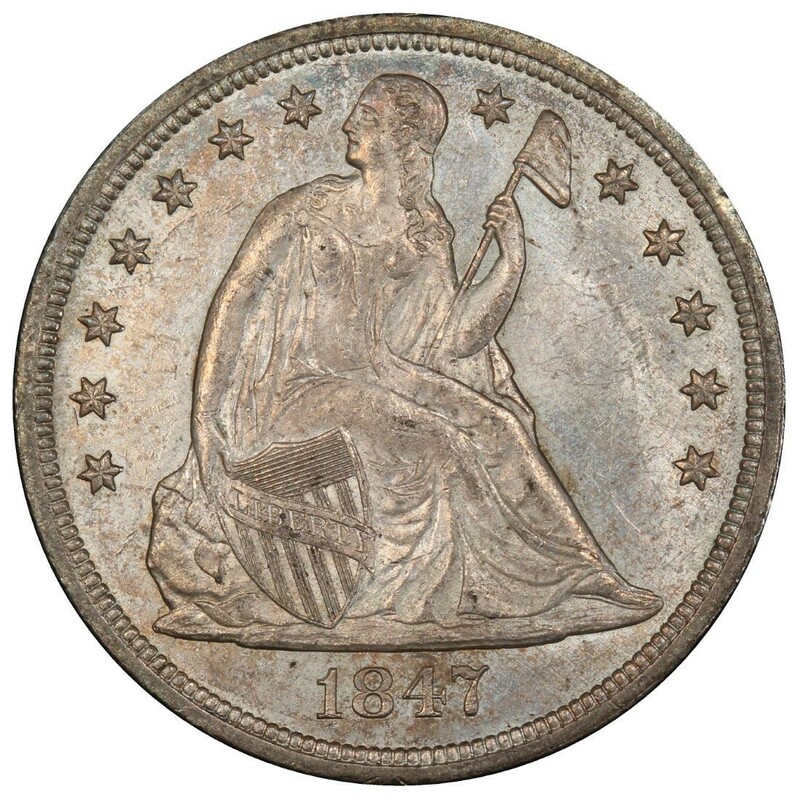 1847 Liberty Seated dollars are scarce 19th-century type coins that are quite popular with collectors of rare U.S. coins. Though Liberty Seated silver dollars contain nearly a full ounce of silver, they are far more valuable numismatic treasures than as silver coins to be stacked for their bullion merit. Liberty Seated dollars were designed by the noted United States Mint Chief Engraver Christian Gobrecht. He also designed the other coins that share the Liberty Seated motif of the mid 19th century. Seated Liberty silver dollars were made from 1840 through 1873 and were issued by the Philadelphia, New Orleans, Carson City, and San Francisco Mints. However, in 1847 they were struck only at the Philadelphia Mint to the tune of 140,750 pieces. Today, 1847 silver dollars are worth between $300 in a grade of Very Good-8 and $2,700 and up in uncirculated grades. Proofs are quite scarce and are worth $26,000 or more. 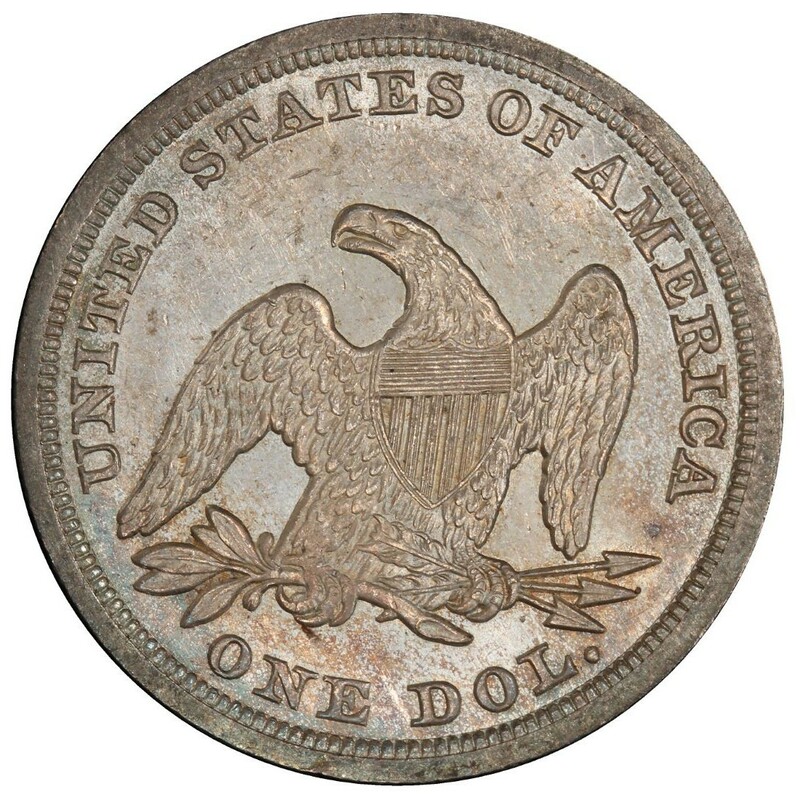 In all, Liberty Seated silver dollars are tough coins to find in any condition, with original, uncleaned pieces the most difficult to locate and generally most valuable. When Liberty Seated dollars were first made in the 1840s, they were widely used in general commerce. They disappeared from general circulation as silver prices rose in the 1850s and saw their most common action in foreign trade. 1847 Liberty Seated dollars consist of a 90 percent silver and 10 percent copper composition, weigh 26.73 grams, and contain 0.77344 ounces of pure silver. They also measure 38.1 millimeters in diameter – the standard width of all large-size U.S. silver dollars made since the mid 19th century, including the ever-popular Morgan and Peace silver dollars.